What is Natural Hazard Risk? hazard: how big and how often? exposure: what elements are at risk (people, buildings, infrastructure, agriculture etc.)? vulnerability: how does each exposed element respond to the level of hazard? Estimating risk is an uncertain science as it involves forecasting events for which the time and location might be largely unknown. This uncertainty is captured mathematically by the concept of probability. vulnerability: retrofitting older buildings that were built to lower building standards or before building codes were enforced. A hazard is a natural or man-made event that has the potential to cause impacts to people, buildings, infrastructure, agriculture, environmental assets and communities. 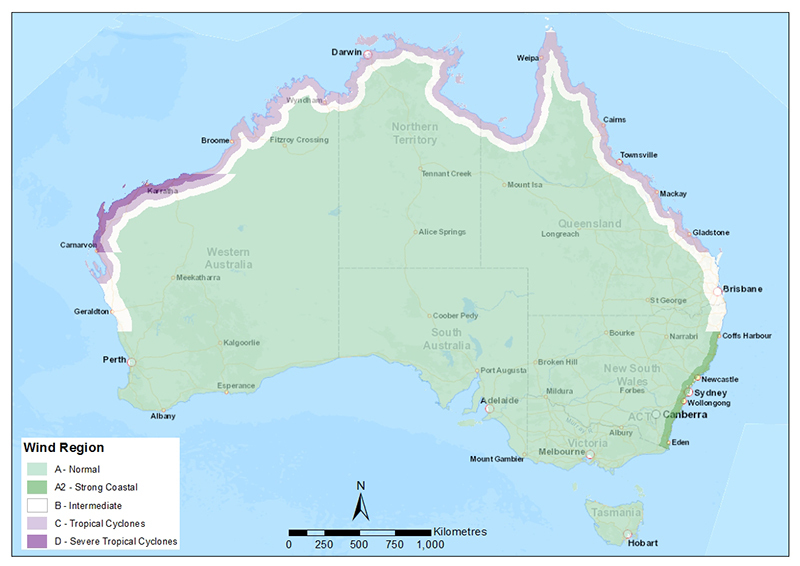 Geoscience Australia develops data and information for bushfire, earthquake, flood, nuclear explosions, severe wind (e.g., from a tropical cyclone), tsunami, landslide, volcano, coastal erosion and blasts. How do we model hazard? Hazard modelling helps us understand a hazard's intensity (or magnitude), frequency and source. It is typically underpinned by mathematical models that describe the propagation of the hazard across the landscape. Without knowledge of the past, we cannot predict what might happen in the future. Historical catalogues are used to understand the frequency of hazard events. They help us develop synthetic event sets that represent, for example, up to 10 000 years of events. This allows us to understand what might be possible in the future and to prepare for events that we have not seen in our lifetime. For rarer hazards such as earthquakes, palaeoseismological investigations play a critical role in identifying and characterising individual pre-historic events that make up the neotectonic record. Probabilistic hazard modelling considers the full synthetic event set, whereas scenario modelling considers a single event (which could be taken from the synthetic set, or based on an historical event). in collaboration with the Australian National University, ANUGA (a hydrodynamic model). EQRM, TCRM and PTHA can be used for scenario and probabilistic hazard modelling. Exposure refers to the elements at risk from a natural or man-made hazard event. This could include: individuals; dwellings or households and communities; buildings and structures; public facilities and infrastructure assets; agricultural commodities; environmental assets; and business activity. Exposure information is about the location and characteristics, or attributes, of each of the elements and is therefore about what is at risk. This information feeds into a natural hazard risk analysis to identify what elements at risk are in the location, and enough information about each of the elements to help understand how they are likely to behave when subjected to natural and artificial hazards. Understanding what is exposed to a hazard event through readily available, comprehensive and consistent national exposure information allows the Australian Government, state and territory jurisdictions and emergency management and planning agencies to make informed, evidence-based decisions to prepare, respond and recover from any events. Vulnerability to natural hazards is an integral factor in understanding the true extent of risk. Although there is no single definition for vulnerability, it generally refers to the impact a hazard has on people, infrastructure and the economy. This is, it asks how large an effect does a hazard of a certain severity have on a particular element at risk? Vulnerability can be divided into four main areas¿physical, social, economic and system-depending on the class of elements at risk being considered. Physical vulnerability is the potential for physical impact on the built environment, infrastructure or population. Information on the vulnerability of buildings and infrastructure has been developed in countries such as the United States and in Europe, but different building techniques, standards and materials adopted in Australia require significant model calibration and testing under Australian conditions. Vulnerability models of people to physical injury, known as casualty models, have also been developed internationally based primarily on empirical data linking the likelihood of occupants being injured or killed in the event of building damage or failure. How we model physical vulnerability? Physical vulnerability is modelled through describing a probable damage severity or economic loss for a particular type of infrastructure when it is subjected to some level of hazard. Take for example a residential building with brick walls and a tile roof that is subjected to a particular level of ground motion due to an earthquake. Our models define the probability that the building will be in one of five damage states. Each of those damage states has a repair cost associated with it and likely level of habitability. The overall outcomes predicted for the buildings are not necessarily correct for each specific building, but should be representative of the overall population exposed to the same hazard. engineering models: these are based on our knowledge of the structure and its components and how they will behave when loaded. This type of model is difficult to develop and will require calibration against empirical data. However it permits an assessment of what contributes most to the vulnerability, and the cost-effectiveness of various mitigation strategies to be assessed. Just as different types of buildings respond to hazards in different ways, individual people respond to hazards in different ways. Social vulnerability refers to the factors that influence the way people, households and communities react to a hazard and to the things that influence the losses they experience. Social losses are not always financial; outcomes such as poor health, mental health issues, loss of social interactions, loss of identity and family breakdown are all social losses. Social vulnerability is nested in that the losses of an individual can impact on the whole household, and the losses of a household can affect a whole community. Community can been viewed as either a contained geographic area, such as a town or neighbourhood, or a group of spatially dispersed individuals who meet for a collective purpose, such as a sporting team or theatre group. health and mental health: people with poor health or mental health issues are at much greater risk of harm or death when a hazard occurs. Conversely, poor health and mental health are common outcomes of disasters in previously healthy people. There is currently little quantitative data available for the small areas required for social vulnerability assessment. How do we estimate social vulnerability? Social vulnerability is assessed using socio-economic analysis of communities, largely based on demographic data from the Australian Bureau of Statistics, but supplemented with other data sources. Depending on the area, qualitative data may also be available to expand the assessment to cover the other factors that influence vulnerability. When assessing large geographic areas, the areas are divided into smaller multiple areas and the data is mapped. These maps provide indicators of relative risk to highlight the areas with the highest levels of social vulnerability. Intangible costs: any direct or indirect cost that does not have a market value, such as death and injury, loss of memorabilia, disruption to social activities or loss of environmental assets. Intangible costs are difficult to measure and so non-market valuation techniques using proxy values are usually used. Ideally, an economic assessment of potential or actual losses from a disaster will incorporate all of these loss categories. However direct tangible losses are the simplest to obtain, because they follow more directly from the physical impact, while intangible losses are complex, so many assessments include direct tangible losses only. Critical infrastructure facilities are made up of many different components that work together to deliver services to communities. These can be electric power stations, water treatment plants or telecommunication hubs. Some components might be more vulnerable to hazard exposure than others. Some might be more critical to the functions of the facility, could be a more costly component or require longer lead time to restore. The susceptibility of a critical infrastructure facility to severe hazard in terms of damage and service disruption is called system vulnerability. How do we model system vulnerability? System vulnerability is assessed by creating a network model of the facility that represents the key components and their relationship to others. As the natural hazard intensity is increased the component damage, loss of function and implications for facility service delivery is assessed. Information on the likely prognosis for the facility returning to service is also predicted from repair cost and restoration time. The software application developed by Geoscience Australia for simulating the vulnerability is called the System for Infrastructure Facility Resilience Analysis (SIFRA), which is available openly. It also enables the effect of retrofitting more vulnerable components to be modelled so optimal mitigation strategies can be developed by asset managers. Natural disasters regularly impact Australian communities. They damage buildings and infrastructure, disrupt essential services, disrupt business activity and impact households. These consequences require time and resources to enable recovery. However, they also provide opportunities to learn about the current vulnerabilities of what make up our communities, the factors that are contributing to these vulnerabilities, and of the opportunities to mitigate these. This information can help avoid damage, understand risk and inform measures to make our communities more resilient. How do we conduct post-disaster surveys? The Rapid Inventory Capture System (RICS), which was developed at Geoscience Australia to capture high resolution street view images after a disaster. The system is transportable, is readily affixed to a vehicle, and can operate up to four cameras concurrently. The supporting software system is available openly under a Creative Commons licence. Hand-held computers incorporating a GPS, high resolution camera and ruggedized case are used for consistent data capture. They have hazard-specific survey templates that enable building types and damage severity to be captured in a consistent digital form. To review field data alongside other information and data sources, Geoscience Australia has developed a desktop information processing platform called the Field Data Analysis Tool (FiDAT). The tool also incorporates Open Source geospatial information system software to enable other information to be developed, such as building footprints. Survey instruments have also been developed for postal and on-line survey of households and businesses. These tools enable information on impact, associated costs, risk perception, response t warnings and recovery to be captured. These tools are particularly useful in tracking the longer term effects of disasters on businesses and households and the level of their recovers. What is the difference between hazard, impact and risk assessments? What is the probability of a given flood height, wind speed, or level of earthquake ground shaking occurring at a given location? What is the flood height, wind speed, or level of earthquake ground shaking for a given return period or annual exceedance probability? How does the hazard vary spatially? That is, which area is more likely to experience floods, severe wind or earthquakes? What is the building damage for a magnitude 5 earthquake occurring near Perth? What would the building damage be if an event similar to Tropical Cyclone Tracy was to occur again? What would the building damage be for a 500 year return period tropical cyclone event to impact Cairns? What would the building damage be for the same event if the vulnerability of pre-code buildings were mitigated by strengthening them to current building code standards? What is the annual expected building loss from earthquake events for a given location (e.g., Perth Cities Project report)? How does the loss estimate change with mitigation strategies enforced? Which areas will experience higher building loss from earthquakes? Which communities are more vulnerable to earthquake risk? How can we use risk models? Risk models that have a physical basis inherently allow improved forecasting of events and their impacts. This is particularly relevant for events in which the total risk might be affected by changes in the natural environment, such as through climate change, or by changes to the built environment as a result of new building codes and/or land-use planning decisions, or by changes to the social environment such as through increased public awareness. Risk models can be used to perform cost-benefit analysis for various forms of mitigation involving short-term solutions, such as early warning and response, along with long-term resolution, such as land-use planning, improvements to building codes and infrastructure standards and retrofit of older buildings. Although some residual risk is inevitable, it can be moderated through insurance when it is available. Risk models can also be used to develop disaster scenarios for emergency response and recovery, to improve community awareness and to evaluate risk acceptance thresholds for a wider range of stakeholders. The effective development of risk models requires comprehensive data which embraces hazard, exposure and vulnerability. Model development also needs to be carried out by experts from a range of physical sciences including the earth sciences, meteorology and hydrology as well as from engineering in areas such as structural engineering, the environment, software and computational methods. It also requires experts from the social sciences, including sociology, economics and emergency management. Most models capture risk in a rather limited context and are usually confined to the direct damage or cost of a future disaster. Research is needed to extend these estimates to include indirect effects such as loss of income and quality of life as well as other social, political, and economic factors which invariably play a role in decisions about risk. Advances in risk modelling also can be used to develop scenarios for natural disaster response and urban planning, to educate the community and to evaluate risk acceptance thresholds for a wide range of stakeholders. For future models to be effective, broader input and more comprehensive data will be required from a range of stakeholders and end users, such as governments, emergency managers, planners, insurance companies, utility managers and operators. Models and databases also need to be tested and validated using a variety of sources, including data collected from past disasters. Tools will need to be developed to translate the complex analysis into user friendly information to support decision-making on risk treatment options. Australia has been impacted severely by natural disasters (Ladds et al, 2017). More recently, the events of 2011 generated a record high impact, with the floods in Queensland and Victoria followed by Tropical Cyclone Yasi. In 2009, the Victorian bushfires the Victorian Bushfire Royal Commission estimated the cost at more than $4billion (2009 Victorian Bushfire Royal Commission). These figures are the lower limit of the true impact, as the cost in terms of lives and socio-economic consequences greatly exceeds these dollar values. Globally, there is a general acceptance that investment in prevention and preparation will reduce the costs incurred when a hazard strikes with studies suggesting that $1 invested in disaster mitigation could save $4 in response and recovery (Multihazard Mitigation Council, National Institute of Building Science). What is Geoscience Australia's role to in reducing risk to Australians from natural hazards? provides spatial support and advice to the Crisis Coordination Centre within Emergency Management Australia as part of Geoscience Australia's collaboration with the Attorney-General's Department. How do we model exposure? The National Exposure Information System (NEXIS) is a Geoscience Australia capability designed to provide comprehensive and nationally consistent exposure information to enable users to understand the elements at risk. Exposure information is produced by sourcing the best publicly available information, statistics, spatial and survey data about buildings, demographics, community infrastructure and agricultural commodities. Buildings and structures are classified into overarching categories of land use: Residential, Commercial, Industrial, Institutions (public), Infrastructure and Agriculture to aid data collection and synthesis from a range of sources. 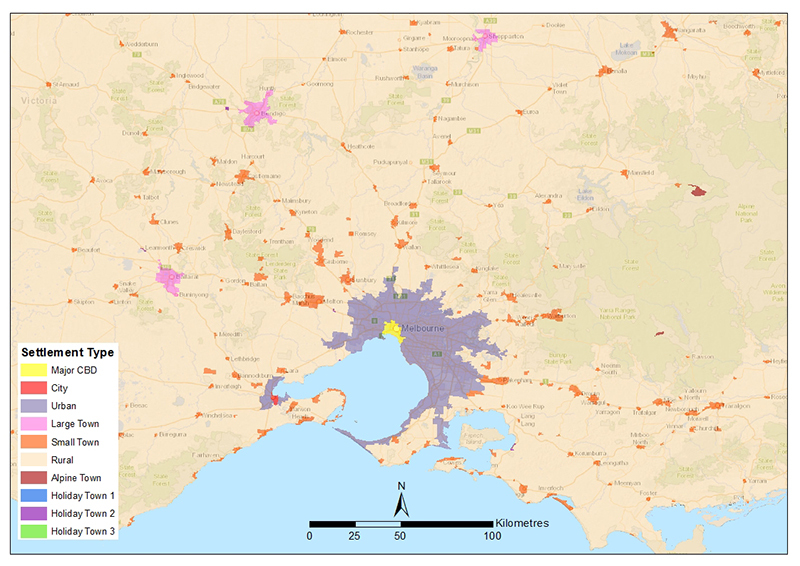 Sometimes datasets only cover a specific building attribute or region of Australia and to ensure national consistency spatial and statistical modelling is used to populate features with unknown attributes. The building type (e.g. house or apartment), number of occupants, building age, structure (e.g. wall and roof type, number of storeys), household income and other household demographic indicators, building construction and replacement costs are derived from disaggregating regional information and statistical calculations. For this reason, NEXIS information is not intended for operational purposes at the building or individual feature level but provides aggregated exposure information at existing administrative or geographic boundaries. The variables required to assess the risk for residential areas are primarily spatial, structural (construction year, wall and roof materials, building size), economic (construction and replacement cost value) and demographic (population and social vulnerability indicators). In the absence of specific residential information, spatial and statistical modelling has been used to derive information required for risk assessments. Spatial location of a building: Where the actual location of a building is not available from authoritative source data, spatial modelling of the Geocoded National Address File (GNAF), cadastral and land use data is used to derive a building location as well as the number of dwellings at each building location. Structural information: Where actual building structure information is not available, proxies are created to fill any gaps. For example the Tasmanian Valuer-General data contains information on residential roof and wall materials used in the construction. This information is first applied to the actual building it relates to and then used to create statistics from which a standard range of building types can be generated. The building types are applied to individual building gaps in similar regions across Australia. Regions: For each state and territory defined homogeneous areas based on Settlement (10 classes) and Wind (5 classes) classifications have been created to inform construction types, materials and costs which can vary between regions. For example, the types of construction, costs and transport for materials and labour will differ between isolated rural towns in comparison to inner CBD suburbs. Defining homogenous areas enables the ability to apply proxies to similar regions in the absence of building specific data. Demographic and Social Vulnerability: Australian Bureau of Statistics (ABS) Census provides demographic statistics at SA1 or SA2 level and dwelling type where available for census periods. This information is applied to the NEXIS building and dwelling location. Building Replacement Value: The cost to rebuild the same type and sized building with the same materials using current standards at current prices; it does not include market value and land value. Building cost factors are sourced from quantity surveyors and can be adjusted quarterly utilising Rawlinsons quarterly pricing indices. Residential buildings contents value: The contents value is derived based on a percentage of the replacement value adjusted depending on the dwelling income classification: Low income 30%, Middle income 40%, High income 50%. A population density product has been modelled utilising the NEXIS residential dwelling population estimate (see the data dictionary below) at the building location using a nearest neighbour analysis. Population density is calculated by the number of people within 10sqkm, 5sqkm, 1sqkm, 500sqm and 100sqm. Population density is only available as a web map service and has been classified into defined population categories with fixed scale ranges. This product provides a population density distribution raster dataset across Australia. The variables required to assess the risk for the business sector are primarily spatial, structural (construction year, wall and roof materials, building size, number of storeys, basements), economic (construction and replacement cost value) business type, operations (employees and turnover). Structural information: Where actual building structure information is not available, proxies are created to fill these gaps, for example surveys undertaken by Geoscience Australia in industrial zones gather data on construction type and materials used in the structure and facade. This information is first applied to the actual building it relates to, and then used to create statistics from which a standard range of building types can be generated. The building types are applied to individual building gaps in similar regions across Australia. Commercial and Industrial buildings contents value: Due to the variety and complexity of business and industrial types NEXIS does not capture or derive contents value for commercial and Industrial buildings. Business type/ operation: Exposure information relation to business type, number of employees or turnover is not currently available in NEXIS. Agriculture exposure information has been derived using the ABS Total Value of Agricultural Commodities Produced (VACP) applied to cadastral parcels in areas identified as suitable for agricultural production. Agricultural production areas were defined by the areas not classified as Commercial, Crossing, Desert, Easement, Education, Hospital/Medical, Industrial, Mining, Native Vegetation, Parkland, Prohibited Areas, Rail, Reserves, Residential, Road, Transport, Water. VACP value and commodity presence at the SA1 level was applied at cadastre parcel level but are available aggregated to SA1 or LGA. Agricultural commodity list and value estimates are provided for the Year ending 30 June 2011 as well as the 2011-12 and 2012-13 inter-censual periods. Institutions or public buildings include education, health and welfare, emergency services, government, cultural buildings and recreational facilities. Institution exposure information currently consists of counts of some of these institutions by type. The location and institution type information is from authoritative data sources and not derived or modelled. Future exposure information will include construction type and capacity information such as number of staff, beds, students and seating and replacement costs. Infrastructure includes transport (road, rail, stations, bridges, tunnels, ports and airports), communications (antennas, exchanges and towers), energy (fuel and power assets) water and waste facilities. Infrastructure exposure information currently consists of some of these sector types. The location and infrastructure type information is from authoritative data sources and not derived or modelled. Future exposure information will include construction type, capacity information such as kilowatts and litres/mega litres, and replacement costs. The NEXIS data dictionary contains a list of the attributes and how they are derived in its Building Exposure dataset. These include (but are not limited to) those data items listed below with a description. the Census population counts and the number of NEXIS derived residential dwellings. Dwelling: A dwelling is a structure intended to have people live in it i.e. house and flat. Residential buildings: A building consisting of one or more dwelling units and the primary use is to house people. Separate houses (SH): A residential house which is separated from other residential dwellings and does not share a common wall. Semi-detached houses (SD): A residential dwelling sharing a common wall with another dwelling, having their own private grounds with no other dwellings above or below. Flat or apartment building (F0): A residential apartment building up to two (2) storeys. Flat or apartment building (F3): A residential apartment building with three (3) storeys. Flat or apartment building (F4): A residential apartment building with four (4) or more storeys. Wall type classifications: concrete masonry, cavity and solid masonry, veneer masonry, precast concrete, timber, metal sheeting, fibre cement, mud brick or rammed earth and synthetic. Roof type classifications: tile, metal sheeting, concrete, fibre cement, imitation tile and synthetic. Structure value: is the cost to rebuild the existing structure (size and construction material) at current building standards at the current costs. Source: Altus Group Cost Management Pty Ltd, 2010. Building Price Index Quarterly updates, Rawlinsons Australian Construction Handbook, 32 edition, edited by Rawlinsons Quantity Surveyors and Construction Cost Consultants, Rawlhouse Publishing, Perth, Western Australia. Contents value: is calculated as a proportion of the replacement cost, adjusted for depending on the gross income classification: Low income 30%, Middle income 40%, High income 50%. Footprint: Area of the building footprints calculated in metres. Floor area: Area of the total building (footprint x number of storeys) calculated in metres. Gross household income: Nil, low ($1-$599), middle ($600-$1999) or high (greater than $2000) gross household income: For each dwelling type (SH, SD, F0, F3 and F4), a percentage is applied to calculate if that dwelling has a Nil, Low, Medium or High gross household weekly income as a proportion of all dwellings of that type. Dwellings with a negative gross household income are included in the Nil category. The low income household is determined by using the OECD definition of half the national median. In 2011 the national median was $1234/week, which gives a low income measure of $617/week. This has been adjusted to $600 because it is the nearest category in the Census data. High income is set to $2000/week, as this category reflects the top deciles nationally. ABS Census 2011. Equivalised household income: For each dwelling type (SH, SD, F0, F3 and F4), a percentage is applied to calculate if that dwelling has Nil, Low, Medium, or High equivalised total household income as a proportion of all dwellings of that type. Dwellings with a negative equivalised total household income are included in the Nil category. ABS Census 2011. Equivalised total household income is total income adjusted by the application of an equivalence scale to facilitate comparison of income levels between households of differing size and composition. An ABS-modified OECD equivalence scale is used where 1 point is allocated to the first adult, 0.5 points to every subsequent adult and 0.3 for every child under 15. Equivalised total household income can be viewed as an indicator of the economic resources available to a standardised household. For a lone person household it is equal to household income. For a household comprising more than one person, it is an indicator of the household income that would be needed by a lone person household to enjoy the same level of economic wellbeing. Residential tenure: refers to the financial arrangements under which someone has the right to live in a house or apartment. Owned - Owned outright or owned with a mortgage. Rented - Rented from a real estate agent or direct from owner. Rented Public Housing - Rented from a State/Territory housing authority or rented from a co-operative, community or church group. Other Tenure Types - Rented from a person not in the same household, occupied rent-free, occupied under a life tenure system and all other tenure types, as a proportion of all dwellings of that type. ABS Census 2011. Do not have access to a motor vehicle: households which do not have access to a registered motor vehicle at or near the dwelling (on Census night) as a proportion of all dwellings of that type. ABS Census 2011. Aged less than 5 years: household with one or more persons aged between 0 and 4 years as a proportion of all dwellings of that type. ABS Census 2011. Aged 65 years and over: household with all persons aged 65 years and over as a proportion of all dwellings of that type. ABS Census 2011. One parent families: household containing a one parent family with children under the age of 15 as a proportion of all dwellings of that type. ABS Census 2011. Persons needing assistance with core activities: household where one or more persons needs assistance with a core activity as a proportion of all dwellings of that type. People with a profound or severe disability are defined as those people needing help or assistance in one or more of the three core activity areas of self-care, mobility and communication, because of a disability, long term health condition (lasting six months or more) or old age. ABS Census 2011. No English: household where all persons have low English comprehension as a proportion of all dwellings of that type. ABS Census 2011. No year 12 education: household where all persons highest educational attainment is year 11 or below as a proportion of all dwellings of that type. Includes households where all persons have no educational attainment. ABS Census 2011. Voluntary work: household where one or more persons undertook voluntary work as a proportion of all dwellings of that type. Comprises people who spent time doing unpaid voluntary work through an organisation or group, in the twelve months prior to Census night. It excludes work done as part of paid employment, if the main reason is to qualify for a Government benefit or if the work was done as part of a family business. ABS Census 2011. Moved one year: household where all persons lived in a different SA1 in 2010 to the SA1 they lived in on Census night as a proportion of all dwellings of that type. ABS census 2011. Moved 5 years: household where all persons lived in a different SA1 in 2006 to the SA1 they lived in on Census night as a proportion of all dwellings of that type. ABS census 2011.